Victoria and Albert Museum plywood exhibition image by Ron Ellis (via Shutterstock). 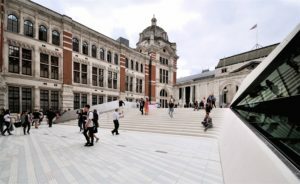 If you live in London, or happen to be heading to the capital, the Victoria and Albert Museum has an exhibition which may be of interest to woodworkers. Entitled Plywood: Material of the Modern World, it aims to set the record straight on plywood’s history. With the material being used by craftspeople as well as furniture designers, it attracted the interest of Christopher Wilk, the keeper of the V&A’s textiles, furniture, and fashion department. Christopher Wilk proposed the idea of a plywood exhibition to the V&A some 20 years ago. He said at the time: “no one had ever seriously researched or written about it. Almost all on the Internet about it is wrong.” He has also had a book published, entitled Plywood: A Material Story. Its release also ties in with the V&A exhibition. Plywood, as we know ourselves at Theo’s Timber, is a versatile material. Since its popularity climbed in the 1930s, it became a ‘must have’ material for furniture designers including Charles Eames. The Eames Lounge Chair and footstool has a plywood base to support the leather chair and leather footstool. Its earliest use was in Ancient Egypt, where a six-layered piece was used for a Third Dynasty coffin. By the 18th Century, it gradually became an alternative to solid wood. The exhibition will be on till the 12 November this year. Afterwards, it will continue as a touring exhibition, though no details of subsequent venues exist at present. Plywood: A Material Story is published by Thames and Hudson in hardback form and is available from all good bookshops and websites, priced £29.95. The Victoria and Albert Museum exhibition is on till the 12 November 2017. Theo’s Timber, 24 August 2017.